Finding ways to lower costs and increase revenue is essential if you want to keep your medical practice afloat financially. With rising business costs, effective and accurate medical coding is more important than ever. It’s the diagnostic and procedural codes submitted with reimbursement claims that mandate the amount providers are paid for their work. Medical practices must make sure they optimize coding procedures for financial success. Try implementing the following tips to ensure your practice is coding more effectively. Although many internal medicine practices are focusing on big coding changes, such as the ICD-10 transition, which makes coding a bit trickier, it’s important for practices to avoid losing focus on the coding basics. With so many new codes introduced and trickier coding, claim denials have increased for many practices. Keep your internal medicine practice in the black by avoiding the following common coding errors that can result in claim denials, costing your practice big time. In a number of specialty practices, such as internal or sports medicine, sooner or later a practitioner may find themselves participating as a consulting physician at the request of another provider. Whether functioning in an orthopedic capacity for x-ray readings, as in the case of a worsening condition, or an internist confirming pre-op surgery clearance, consulting can be tricky to properly code for reimbursement. Adhering closely to changing federal (CMS) and insurance industry guidelines while still providing the services and care required can be challenging; knowing which of the new ICD-10 codes and modifiers to use for accurate, reimbursable billing makes it more so. Managing the medical billing and coding for your practice may seem like a thankless job, but the importance of accuracy to the entire revenue cycle cannot be overstated. Incorrect coding is often responsible for the greatest lost revenue in a practice, causing certain claims to be completely denied and others to be only partially paid. Following up to ensure that claims are fully paid and any errors corrected takes time and a very detailed mind. 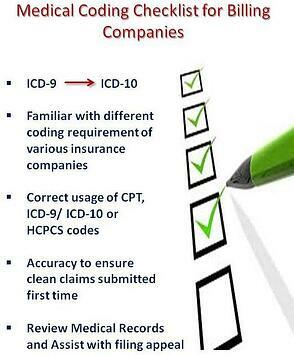 Medical billing codes change on a regular basis, adding complexity to the overall process. Here's how accurate coding can speed your insurance reimbursements and improve your revenue cycle. Medical coding has a tremendous impact on all sizes of medical practices. When done accurately, providers are promptly and properly paid, and patients understand both their healthcare costs and individual financial responsibility. When not done well, a practice’s efficiency, profits and patient satisfaction suffer greatly.